Με την αγορά αυτού του προϊόντος μπορείτε να συλλέξετε 19 πόντους επιβράβευσης. Το καλάθι σας θα είναι συνολικά 19 πόντοι που μπορούν να μετατραπούν σε μια δωροεπιταγή των 3,80 €. With its distinctive folding foregrip, ported barrel, beefy slide and extended magazine the M93R can easily be spotted in countless Hollywood films typically being waved around by some ruthless villain with a seemingly infinite supply of ammunition. Thankfully though you don’t need to live a life of crime to enjoy the thrill of shooting this unique pistol. 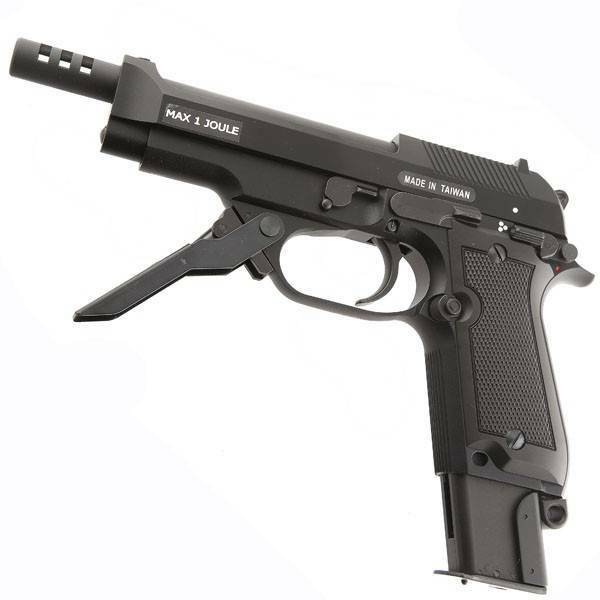 Made by the Italian Beretta company, the M93R is a machine pistol with selective fire. The "R" stands for Raffica which in turn means "burst" in Italian. Designed in the 1970s it was meant for both military and law enforcement use, offering extra firepower in a small concealable package for purposes of VIP protection or for close quarters combat. KWA has reproduced the classic M93R pistol complete with Semi, 3-burst, and full-auto modes. It will perform the usual semi auto and full auto like most other machine pistols but it will also perform a 3 round burst which is something rarely seen. With one pull of the trigger this pistol will fire three separate shots in just two tenths of a second. If you were to flip it over to full auto the 32 round magazine would be emptied in just over 2 seconds! Needless to say in fast paced, room to room shootouts the M93RII is a formidable weapon. This is a full metal version. 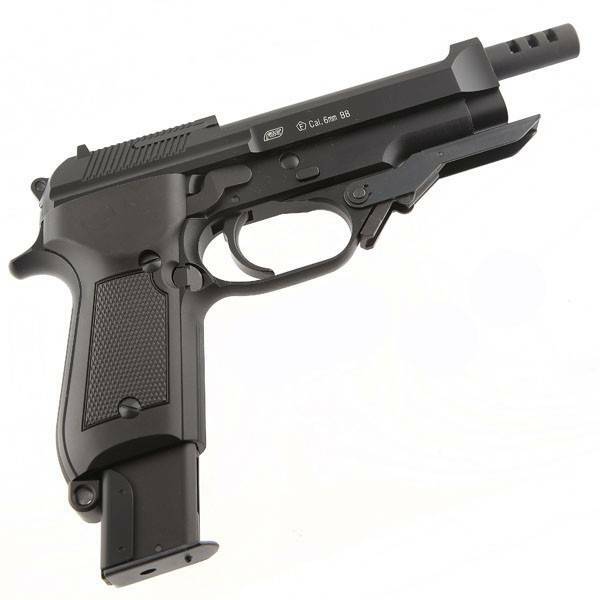 Everything on the pistol is metal, except the polymer grips like any other M92/93 pistol. The enlarged trigger guard in combination with the included catch allow the second hand to grab a rudimentary second hand grip to stabilize full auto shooting. While more necessary on the real weapon with actual recoil, in this Airsoft version it does not hurt to keep the weapon steady for more accurate shooting and better control and of course for the sake a of an accurate replica. The pistol offers reinforced imternals, that combined with the long barrel offer hard shooting and strong kick. The model shoots around 340 to 350 FPS out of the box that combined with the adjustable Hop Up will outperform most of the other pistols in any game. 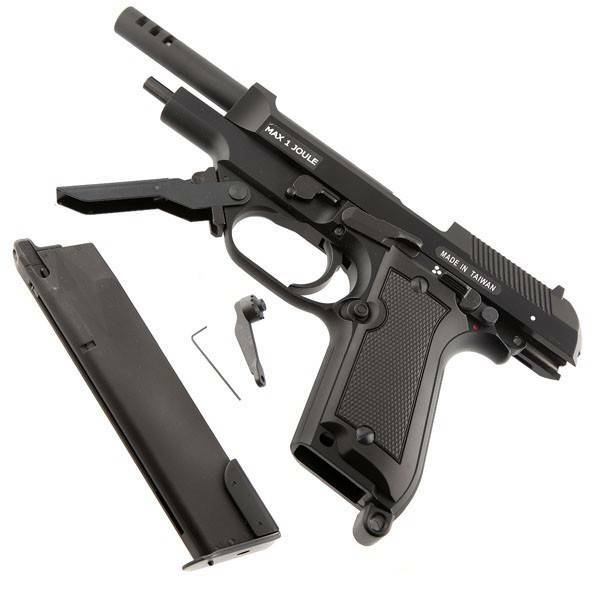 The magazine is an elongated and High Capacity that holds 40 BBs.